Posted on April 26, 2012 by C.E. Now is the time to find ripe strawberries at local farmers markets and roadside stands. 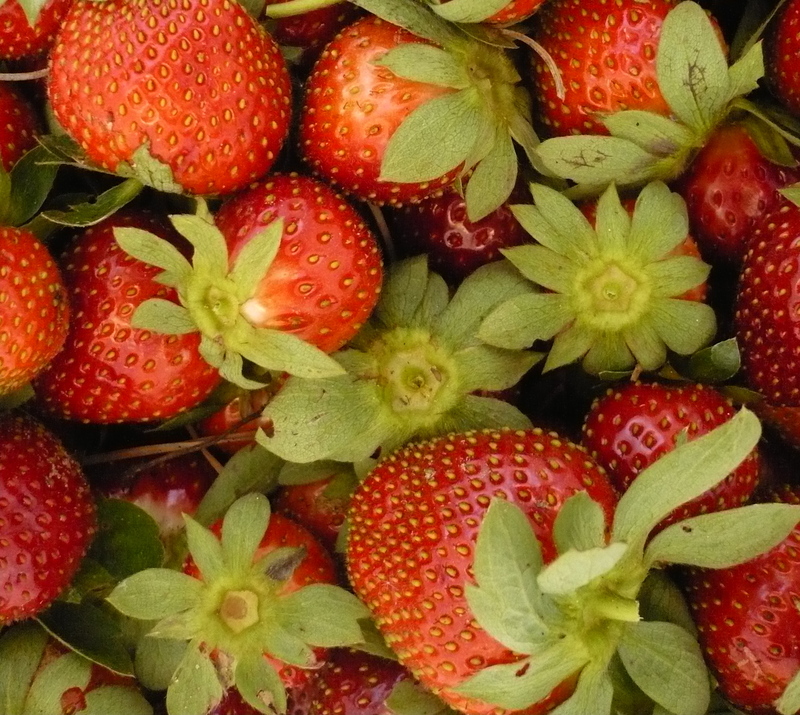 ∆ Berry fans, rejoice: The local strawberries are ripe! I picked quite a few quarts on Tuesday during my volunteer shift at Full Earth Farm, and got to take some home. We ate all of them fresh — the first ripe strawberries of the spring never last more than minutes around here — but next time I luck into a berry bounty I’m going to restrain myself long enough to make this recipe, which was inspired by a dish served at Disney World’s Grand Floridian Resort: Simple Strawberry Soup from Christy Jordon’s Southern Plate blog. ∆ Paella and flamenco make the perfect picante pairing. On Friday, April 27, you can relish both at Mission San Luis, 2100 W. Tennessee St. Award-winning guitarist Grisha Goryachev will perform modern and traditional flamenco music while local caterers Real Paella serve a sit-down gourmet dinner that includes sangria, Spanish salad, flan and, of course, paella mixta with vegetables, meat and seafood. The event begins at 6 p.m. Tickets are $35. Visit the Real Paella website to order tickets or call 339-2043. ∆ In the epic battle of the big coffee chains, I’ll choose Dunkin’ Donuts over Starbucks every time. So I was thrilled to discover that filmmaker Whit Stillman prefers the Double D, too. In fact, the crew on his just-released film “Damsels in Distress” was treated to two Dunkin’ Donuts runs each day. I found out about Stillman’s coffee predilections, along with a handful of unexpectedly intriguing everyday insights, when he was featured this week in Bon Appétit’s My Morning Routine series, which explores how people kick-start the day. ∆ Do you dream of owning a food truck? Find out more about how to make it happen at the Food Truck 101 Workshop offered by the Tallahassee Food Truck Association. The event is set for 11 a.m.-2 p.m. Saturday, April 27 at the All Saints Hop Yard, 453 All Saints St. Attendees will learn about required licenses and registrations, insurance, suppliers and more, and will have the chance to talk with food truck owners who’ve already hit the local streets. The cost is $25. To register in advance, visit the Tallahassee Food Truck Association website. ∆ Roll into National Bike Month with the Capital City Cyclists, who are encouraging Tallahassee-area bicyclists to get together for dinner at a different local restaurant on each Wednesday in May. The Dinner by Bike series kicks off on Wednesday, May 2 with a meal at Mike’s Stone Baked Pizza, 1313 Jackson Bluff Road. Start your ride from home, work or school and meet up with other riders at the restaurant anytime between 5 p.m. and 9 p.m. For more information about Dinner by Bike and other National Bike Month events, visit the Capital City Cyclists website.